Team USA Olympic Swimmers Had Eventful Day at Seacrest Studios in Atlanta! 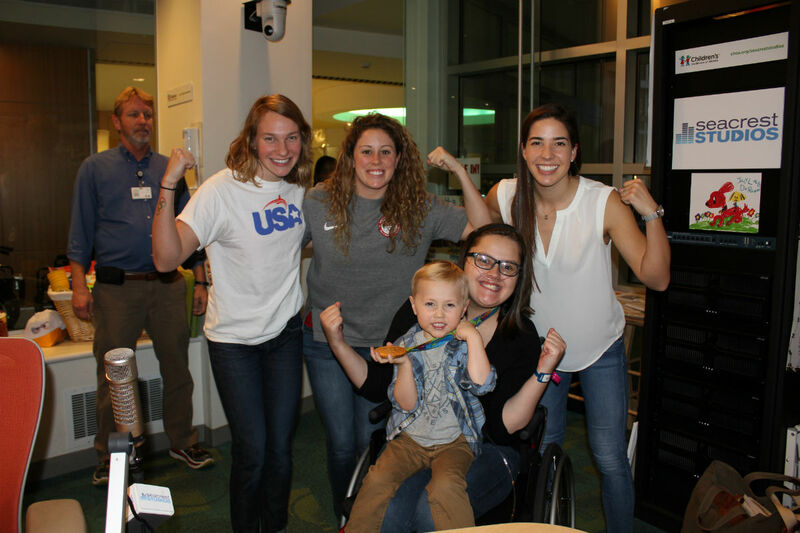 Proof that Olympic swimmers have nerves of steel, 4-time medalist Maya DiRado and teammates Melanie Margalis and Molly Hannis didn’t let a little ‘ol TORNADO and studio evacuation affect their visit with patients at Seacrest Studios at Children’s Healthcare of Atlanta last Wednesday! While huddled in an interior room, the elite athletes shared exciting stories about their experiences as an Olympian – everything from the pure elation of realizing they’d made the US Olympic Team, the pride they felt when collecting all the TEAM USA gear, to the surreal moments of standing on the podium accepting a medal from the 2016 Rio de Janeiro Olympics! When asked by one patient “If you could be an Olympic level athlete at a sport other than swimming, what would it be?” Maya answered tennis, Melanie said running and Molly chose soccer. Finally, when the tornado passed, the “All Clear” sounded and we could return to the studio for autographs and pictures holding Maya’s gold medal (it’s very heavy!) For Maya – it’s retirement from the sport but for Melanie and Molly – it’s back to the pool where they’ll be swimming in a meet at Georgia Tech and then it’s off to Canada for the World Championships! It was a crazy weather day in Atlanta, and one we’ll never forget. Thank you, Maya DiRado, Melanie Margalis and Molly Hannis for inspiring all of us. Your hearts are as big as your accomplishments!